By Meredith Mazzotta on September 15, 2010 . CSIS invited the former U.S. Global AIDS Coordinator George Mark Dybul from Georgetown University to argue in favor of the transformation, and Julian Schweitzer of the Results for Development Institute to argue against. Mark Dybul, left, debates issues surrounding the Global Fund with Julian Schweitzer, right, and moderator Susan Dentzer, editor-in-chief of Health Affairs. Both agreed that a transformation was needed to instead address overall health. Consequently, the debate focused on what that transformation would look like and how to address the broader health goals rather than the 3 global pandemics. What the debate was missing was a voice that supported the Fund’s concentration on AIDS, TB and Malaria. There was also little discussion about financing a broader effort, or about how a broader effort would continue to address the three leading infectious disease killers. The Global Fund is the leading source of global funding for TB and Malaria and currently financing HIV treatment for more than 40 percent of persons currently receiving antiretroviral therapy. 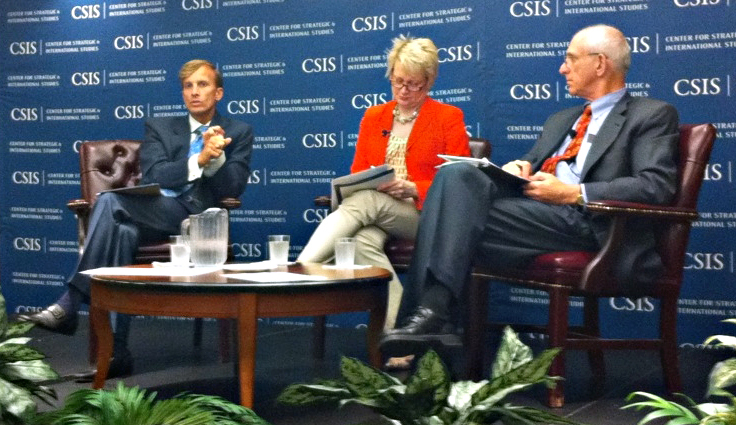 Both Dybul and Schweitzer agreed on the problems that the current structure of the Global Fund has at present: insufficient country ownership, tendencies for large donor institutions to become even larger and more bureaucratic, and to some extent the need to separate those who provide technical assistance from those actually funding the programs. They did however differ on the means of addressing these problems. Dybul supported promoting country ownership by creating a panel with representatives from the major program funders – The U.S. government, private funders, and international groups like the Global Fund. Then individual countries would submit their national health plans to this panel, which would provide feedback and coordinate the means by which the individual parts of the health plan would be funded. Schweitzer on the other hand was not sure that an international mechanism could handle the job. He instead recommended using current models of successful interventions — such as Rwanda, Cambodia, Ethiopia and India – as examples, and encouraging other countries to take the lead in dictating how funds are used in-country. “No amount of engineering at the international level will make this work,” Schweitzer said. “You have to have countries that have the capacity to be able to control the donors, not the other way around.” He added that providing the technical training countries need to help themselves in this regard is a key intervention. This entry was posted in Uncategorized on September 15, 2010 .